With crowd sourced data from all 50 U.S. states and over 52 countries around the globe, we are learning from the most important source: You. After two years, over 3,500 people have registered. The results below are based on a sample of the first 2,874. For data on the first 1100 to register, see the old results page from 2012. The percentage of male and female registry members is almost identical, which is surprising when compared to the National Weight Control Registry which is 80% female. Out of the first 2,874 people to register, the average age is 40.3, median age is 39, with a standard deviation of 12.2. The youngest person to register was 15 years old, and the oldest was 81. The average age in the National Weight Control Registry is 47. Clearly, the sample continues to be heavily biased towards those who identify themselves as 'White'. The Majority of Registry members graduated college. Those who have a graduate degree of some kind (29%) were the second most represented group. 4% of members finished high school and not college, while the remaining members have completed 'some college' or obtained an associates degree (not shown). The socioeconomic status of the registry members tilts towards the upper class. Of course, all studies are biased by the study subjects, and this one is no different. This sample is heavily biased towards people with computers who use the internet to find nutrition information. Over 40% of registry members follow the Primal Blueprint, a very popular version of the paleo diet. 15% reported using the Paleo Solution, while only 13.5% of registry members follow an Atkins diet. This is a dramatic change from last year, when Atkins was the most popular. Other diets that were less represented included those that eliminated starches and grains only, Zone, and South Beach. Many registry members cited Gary Taubes' books as the main reason for their success. While surprising at first glance, people eating a high protein, high fat diet while low in carbohydrates lose weight despite not counting calories. In clinical trials, the subjects assigned to the low carb diet are told to eat ‘ad libitum,’ Latin for “at one’s pleasure.” Despite this lenient recommendation, these subjects seem to lose the most weight. Whether they spontaneously eat less total calories, or there is less net-insulin release in response to their low carbohydrate intake, the results are clear: People who eat high protein, high fat diets, seem to lose more weight without counting calories. Based on the responses to our question asking what side effects people experienced when they first began their program, 0.4% reported gout, 0.6% had joint pain, 3.5% were nauseous, 4.7% reported orthostatic hypotension, 6.5% had diarrhea, 11.7% had bad breath, 13.3% had trouble concentrating, 15.8% were constipated, 23.2% had no side effects, 24.2% immediately felt better, 24.4% had headaches, and 30.6% reported feeling weak. Subjects that slowly transitioned into their new way of eating were more likely to experience no side effects, and less likely to report feeling weak or experiencing headaches. The size of words in word cloud above are a function of how frequently each word appeared in the reported benefits free responses. Out of the 'Other' option of side effects, members commonly reported withdrawal-like symptoms, very similar to those smokers experience when trying to quit. Headaches, irritability, intense cravings for carbohydrates and sugar, and flu like symptoms were common as people transitioned to their new way of eating. Among the 2,874 members, 74% reported increased energy, 57% reported improved mental health (commonly described as a sense of clearness, or a sudden disappearance of a 'brain fog' they felt), 47% said their athletic performance improved, 32% said their joint pain or arthritis improved or disappeared completely, and 30.7% reported improvements in their blood sugars. While the above responses can be quite vague, many of these reported benefits are corroborated by the subject's free responses, which offer a more accurate, unbiased representation of the actual outcome related to their paleo or low carb nutrion. The free response perhaps offer the most accurate, pure window into the benefits that more likely can be attributed to the change in diet. Without leading questions or check-all-that-apply boxes, the free response allows each registry member to spontaneously volunteer symptoms and improvements they experienced. While one or multiple such reports are likely unreliable, hundreds of similar reports from dozens of countries and varying demographics suggest a very real effect that a paleo or low carbohydrate diet may have had on each individual's health. And herein lies the beauty of crowd-sourced data. Due to the sheer volume of text submitted from the nearly 3,000 members, it would be nearly impossible, highly inefficient, and more subject to any inherent biases we may have to manually comb through all responses and pick out quotes related to a particular topic. Instead, we use a computer script that searches our database for reports related to a particular keyword and aggregates them all into a condensed file for further analysis. Below are small selections from three topics: Skin, Arthritis, and IBS. For a more comprehensive list, see the testimonials. "A dry skin condition I had since high school cleared up." "30 days later [after starting] and I had lost about 30lbs, I wasn't chronically oedematous, my skin had cleared up, I had more energy than ever and my mood had brightened considerably." "I feel healthier, have much improved skin, less congestion, and feel like I am reducing my body's stress. I used to get cold sores regularly, and when I went to the dermatologist and asked why I get them she told me that my body was stressed. Well, I didn't know why that would be because I always thought I ate healthy. I haven't had an outbreak since I started this diet." "My knees and hips, which always ached, but I ignored had stopped hurting. My skin cleared up. Amazing!" "Clearer skin, reduction in exzema/dermatitis." "My hair was dry, my skin was flaky and spotty, nails brittle, and I was pretty much always exhausted. I can't remember how I found Paleo, but I was doing some researching online and found other people who had been living like I had been and feeling the same way until they dropped the sugar, grains, processed everything, etc. So I tried it and it was amazing...my hair/skin/nails improved even more." "My skin cleared up (used to get cystic acne)." "Decrease in acne on face and back"
"I have had severe acne since 5th grade and still medically treated at age 40 -- now i am off all treatment and rarely have acne; my skin is the least oily in my life (on a high fat diet)"
"I also had really bad acne. Chronic eczema too, which I was prescribed anti-inflammatory steroids for. I also got sick at least once a month...Once I cut out grains, sugars, beans, and vegetable oils completely from my diet, I noticed immediate positive changes in my health AND body composition!... My acne cleared up. I spent more time in the sun. I dropped all the prescription meds." "Then I read Gary Taubes and eliminated all grains (including a daily large dose of wheat germ) and started consuming much more fat, esp. animal and dairy fat. Amazed myself by reducing to 115 pounds (what I weighed as a 15-year-old) in less than a month. After a year, I am still at that weight, and my BMI is about 19. I used to have terrible arthritis pain in my wrists, but the pain is now completely gone. (I credit giving up wheat germ for that.) One of the down-sides is that I realize exercise does not help keep my weight down." "I am a middle aged woman who bought the low fat thing entirely. I was always hungry! I got interested in eating locally for political reasons, then a friend told me about paleo. Though I'd give it a try. It certainly cured the "always hungry" problem and I've been slowly losing fat, about a pants size in 6 months. I've also mainly kicked my antacid habit. I've NOT had any miraculous recession of arthritis or disappearance of sleep issues, yet I don't feel like giving up the way of eating." "My first intro to the paleo diet was from nutrition presentation given at an ADHD counseling center that my older daughter goes to. Thought it was a bit crazy but made sense in a lot of ways so was willing to research further. My research led me to realize that this may be the perfect diet for my younger daughter who was suffering from chronic debilitating headaches that I strongly suspected related to food sensitivites. While both girls were at overnight camp, I tried the diet on myself. Almost immediately I had more energy, arthritis was gone and year round allergies gone. I was gone." "At the age of 30 my doctor was telling me that I had arthritis in both knees and if I didn't lose weight I was headed for the same heart disease that plagued my father's family...I spent the next couple of years trying everything I knew to lose weight, eating "healthy" - three meals a day following the almighty food pyramid, cutting out sweets, restricting calories to the point that I was constantly starving, just aching for my next meal...More than a year later [after starting the Primal Blueprint] I still weigh 170, and still have more energy than anyone else I know at my age. My doctor no longer worries about heart disease, and I have no pain at all in my knees. I am free to play with my growing kids, and enjoy life without anything holding me back." The vast majority of registry members report not being hungry between meals when they consume a diet high in protein, fats and vegetables, while low in grains, flour, and sugar. This is likely the most consistent finding in the registry, and supports the general findings of related clinical trials. Among those registry members who have tried a low calorie diet in the past, the vast majority of them reported being less hungry while eating a carbohydrate restricted or paleo diet. These results cannot be overstated. How can we expect someone to ignore their most basic physiological drive - to eat when they are hungry - simply because they have reached their daily limit of fat calories as mandated by the United States Department of Agriculture? In 1944 Ancel Keys, recruited 36 men into what would be known as the Minnesota Starvation experiment, to determine the physiological and psychological effects of severe and prolonged dietary restriction. The men were fed on average 1547 calories per day, which is generous compared to many available weight loss programs today. "How does it feel to starve? It is something like this: I'm hungry. I'm always hungry - not like the hunger that comes when you miss lunch but a continual cry from the body for food. At times I can almost forget about it but there is nothing that can hold my interest for long. I wait for mealtime. When it comes I eat slowly and make the food last as long as possible. The menu never gets monotonous even if it is the same each day or is of poor quality. It is food and all food tastes good. Even dirty crusts of bread in the street look appetizing and I envy the fat pigeons picking at them." 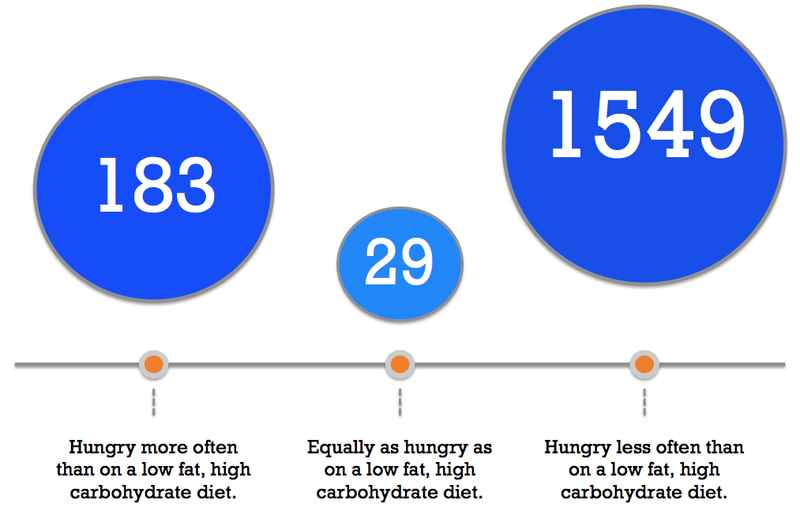 How did the caloric intake of a "starvation diet" become the standard of care today? In contrast, when registry members from Africa to Alabama describe their appetite on a paleo or carbohydrate restricted diet, the results are overwhelming & universal: they just aren't that hungry anymore. "Eating low-carb saved my health; I reversed some early diabetic neuropathy, and went from an obese lump of misery to an active Mum again. I never ever went hungry; and maintaining the weight over the last 7 years has been straightforward. My blood glucose readings are normal - not a cure for diabetes; but a brilliantly easy way of controlling it." "Frankly - besides difficulty finding the proper types of food to eat that are readily available, this way of living is wonderful. I'm in great shape and am rarely hungry. I want to help as many people as I can." "Since February, Ive lost 20 pounds of fat and gained 5 pounds of lean muscle. I eat more and better tasting food than I did while on Weight Watchers (which I had been on for 9 years). The biggest change, though, has been that I no longer am obsessed with food, nor am I hungry every few hours. My carb-induced cravings have disappeared, and for the first time in my life, I feel free. Its transformative." "Giving up grains and legumes on January 1, 2011, was easy with no side-effects. Six weeks later I noticed my clothes were getting baggy. I got on the scale and had lost 12 lbs. I noticed I was never hungry- no snacks and two meals per day usually at 7:00 am and 4-5:00 pm." "I was never hungry; If I was busy, I could actually forget to eat. I felt an amazing mental clarity, which is hard to describe. These things reassured me that I was doing something right." "Since the new year i have been cooking more Paleo but allow for cheeses and yogurt. I am excited to cook healthy foods with veggies and meats we picked up at the local farmers market grown by locals!! I feel better than ever and am hardly ever hungry. In fact I can go w/o eating for more than half the day if I decide i want to fast or something." "I stepped on the scale and got a reading of 399. I might be the only guy in the world who has ever been happy to see 399 on a scale. I have found Protein Power to be easy to follow and today weighed in at 304...I still have a way to go in order to meet my goal, but I have gotten this far without working out much or ever going hungry." "[My] diet roughly followed the normal USDA recommended guidelines with a few things missing and I consumed about 1800 calories per day on average, while not including exercise I typical would burn 2300 calories on an average day. This worked and resulted in 60 pounds of weight loss though I felt like crap and was hungry all the time and of that weight at least several lbs. were lost in muscle."